I recently received an email from a landscaper in Kalgoorlie. Lee Mullen, horticulturist, landscaper and owner of Gan Eden Landscapes, lives and runs his landscape business in Kalgoorlie and also has a great passion for cactus and succulents. 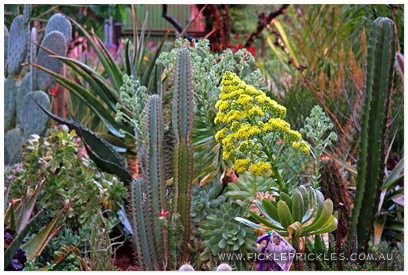 He moved to Kalgoorlie 4 years ago from Perth and has many cacti and succulents in the garden where he lives. He started his collection back in the 90’s when he grew them outdoors in the UK. He then continued his passion when he arrived here in Australia only for it to take over his life. 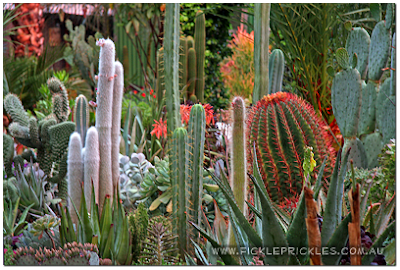 His main love is with Pachypodiums, Aeoniums, Aloes and Agaves however his garden has an amazing collection of numerous other species. I asked him about the climate in Kalgoorlie. He said that the temperatures can reach up to 42C in summer and can drop to around 0 C with the odd -1C or -2C in winter. He mentioned that Kalgoorlie only gets 220mm of rain a year and the vast majority of the species are grown on straight red dirt which is a clay based loam and around 7.5-8.5 in pH. He also mentioned that the drainage seems fine and it also holds nutrients well which although Perth has the drainage ( a little too much I might add) it does lack the nutrients that these specimens would really thrive on. Another interesting tip was to plant closely together, which I thought was a great tip. In my own experience I have also found this very beneficial for the plants help to create a micro climate around each other which reduces evaporation from the soil and also reduces transpiration from the plants. The plants also shelter each other from the severe rays of the sun. They almost tend to look after each other. Thanks for contacting us Lee, and thank you for your great input and photos of your beautiful garden. Well, once some of the roads in Roleystone were declared safe for the public to go through again after the bushfire that wrecked havoc last weekend, we took a wander down Canning Mills Road and were absolutely devestated at the destruction to the Darling Range. This photo just doesn't show justice to the hectares upon hectares of bushland that were completely destroyed, not to mention the countless number of houses that were demolished to the ground within minutes. It is truly remarkable that no one was hurt. I would like to give a massive shout out to the awesome fire fighting departments of Perth and the countless volunteers who put their lives on the line for so many hours on end to battle the massive blaze. Also a BIG thank you to the Salvation Army for feeding our fire fighters, and to the ABC radio for keeping all of us up to date on the latest alerts and warnings. without you we would have truly been really lost! The Lord Mayor's Distress Relief Fund Website . Thank you everyone for all the kind messages we received over the past day or so. Everyone is safe and our property was spared from the bushfires. Thank you so much for all of your support. Not everyone was as lucky though, over 65 houses have been completely destroyed, and even more have been damaged in the Roleystone/Kelmscott area of Western Australia. Our hearts go out to those involved.